Kona Land & Water Escapes is a full-service residential and commercial landscaping company. We create unique, customized landscapes from small condo landscaping to the most discriminating estates. Landscape Repair: Water Features, Irrigation, Lighting and more! Not sure what you want? That’s no problem. We meet with you to better understand your tastes and preferences to design a plan that will make your outdoor living space dream a reality. Our experienced installers bring Tropical Escapes, Sonoran Designs and Japanese Gardens to life for the greater Phoenix area residents. They are highly qualified and trained to create a beautiful Hawaiian paradise, a colorful Sonoran design or a tranquil Japanese garden in your backyard. Quality landscaping done right the first time. 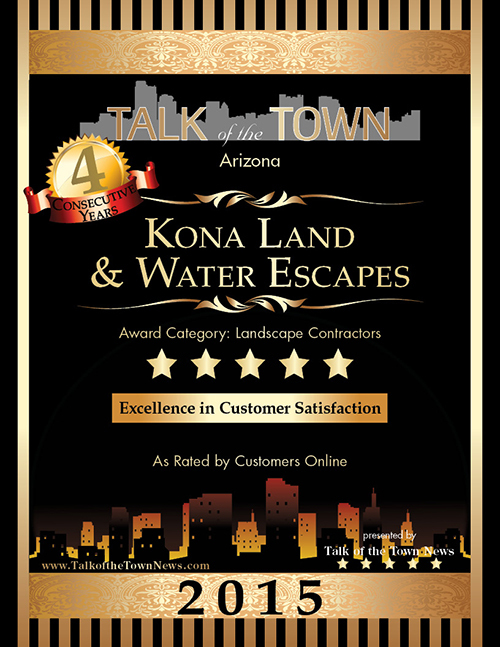 For over forty years Kona Land and Water Escapes has been one of Arizona’s leading landscape design consultants. We take customer service very seriously and guarantee all of our work. 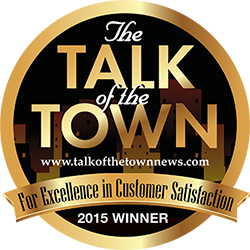 Our award winning design experience will add years of pleasure and value to your home. Call us today so we can design your dream and create your very own personal paradise. "I have to say that your company has transformed our back yard into a beautiful tropical paradise. We didn't realize how much so, until I happened to look at a picture that I had taken the day it was completed and, as beautiful as that looked, compared to what was before, it looks so much more lush and gorgeous now, after only 4-1/2 months. Everybody that sees it (including friends around the world, on our Facebook posts), marvel at the difference between our former rather barren back yard, in which the main focal point was the concrete block wall, and now. With the bamboo trees, plants, ground cover, lawn, floating island, etc., the parts of the wall that are still visible can't compete with the landscaping, and has "receded" into the background. One more growing season, and I'll bet that wall won't even be visible at all any more. We've enjoyed our "little piece of paradise" so much, that we consider it one of the best return-on-investment home improvement projects we've done." "The pricing was more than fair for the work performed. Everyone I dealt with in your company was very professional, knowledgeable and courteous. When the work was completed, everything was left neat and clean, which is very unusual for this industry. Thank you again for a job well done!" "We are so happy with both our front and back yards now that we make sure we spend some time out there every day. Thank you so much for your expertise, time, and patience." "We wanted to express to you how happy we are with the work you did for us. We have several people including our next door neighbor interested in having bamboo in their yards and one who wants a designed flagstone patio like the one you did for us. We will be your best promoters." "Thank you for creating such a beautiful and peaceful retreat in our backyard! It is absolutely lovely. We appreciated your artistic skill, expertise, and experience as well as ability to so excellently oversee the crew’s execution of the project." "You have a very discerning eye for balance and color and the feel of landscape. It was truly a pleasure working with you and everyone involved. Thank you so much for all the work that all of your company did for us and our yard. It is just a paradise! We are just thrilled about everything. We have had so many compliments it is embarrassing!" "From the beginning concept to the finished product, you have exceeded all my expectations. My waterfall is not just a water feature; it really is a total environment. My dream of turning my back yard into a spectacular oasis in the desert has come true." "Your expertise is quite apparent and your word is your bond. of the plants you supplies were beautiful and of the highest quality. The work was done well and on schedule. Thank you for a beautiful landscaping job." © 2012-2018 Kona Land and Water Escapes, LLC. All rights reserved. Website designed by Yo Mama Web Company.